It was late, almost 10.15pm on Christmas Day when my phone signaled a message from General Manager of MPH Publishing, Kuah Sze Mei. I enlarged the poster to see better and recognized the cover design of my book, My Johor Stories: True Tales, Real People, Rich Heritage. Before I could grasp what this means, my eyes widened in awe as I read her next message headlined: MPH is proud to present… The Best of 2017! It was an announcement about the best deal discounts valid from Dec 26, 2017 to Feb 28, 2018 for MPH members and non-members on these selected English, Malay and Chinese titles. As her message slowly sank in, I felt deeply humbled and ever grateful for the publishing opportunity presented to me by Think City and MPH Publishing that led to a book which gained its success through the support of readers, fans and friends. In August, when MPH celebrated the nation’s 60th anniversary of its Year of Independence, I was thrilled to be numbered among Malaysian writers in the MPH Writers’ Circle in a celebration of Malaysian writers during the national day season. Around this time, Sze Mei informed me that MPH Publishing received a special order for a set of my books in hardcover version from Iskandar Regional Development Authority (IRDA) specifically for their Board Meeting scheduled on Sept 5. At their Board Meeting this year, IRDA was proud to present each board member with a copy of My Johor Stories: True Tales, Real People, Rich Heritage as a special souvenir. Now in December – late on Christmas Day – I was greeted with this update from MPH! For my book to be nominated among the MPH Best Non-Fiction in 2017, is more than a pleasant surprise and one of the best Christmas gifts that I never expected to receive! As I look back on my journey in this book project, I deeply appreciate everyone who contributed to the success of my book, in one way or another. You know who you are. Above all, I thank God for His mighty hand, Who opened the way (at one point when there seemed no way!) in a marvelous and most miraculous way! When my book was launched on July 15, this title went to the No. 1 spot of the MPH Non-Fiction Bestseller list in the following week. Since then, MPH Publishing kept me updated about the sale of my book. 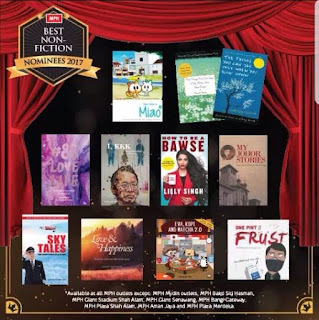 It was both humbling and delightful to keep track of my book’s performance and how it remained on the MPH Non-Fiction Bestsellers list, not only for consecutive weeks but also for consecutive months! While my book is available from MPH Bookstores nationwide and online via mphonline.com, these books also became available from Borders KL in September. Then a few weeks ago, my sister discovered my book on the Non-Fiction shelves of the Popular Bookstore in Da Men Mall in USJ. So they are now also available at Popular KL. In November, I received an email form Elaine Boey, a writer with The Edge, a business weekly magazine, with a request for an interview that would be featured in a special focus section entitled, Uniquely Johor, published with the Dec 18 issue of the magazine. She had a copy of my book and wanted to use some of the old photos of my family and Johor Baru published within, with her feature on me. This interview with a focus on old Johor and my views of the Johor Baru I know, was published in a 4-page feature headlined, A JOURNEY INTO THE PAST – Author Peggy Loh describes the difference between the JB of her youth and the bustling city it has become. Lina, a former classmate who read her subscribed copy, told me that she recognized “my voice” in the words and was puzzled to read Elaine’s name at the end of the feature. So I explained how Elaine had quoted me mostly ad verbatim from the interview. Then a former colleague of my friend Linda, told her that he’s a regular reader of my blog, My Johor Stories, but didn’t reach the bookstore as he lived away from the city. Signing my book on my car bonnet, in the carpark! So Linda volunteered to help him get a copy of my book from the MPH Bookstore in JB City Square. When she mentioned that we would be meeting up during the Christmas season, he asked if she could also help to get his copy of my book autographed. She was of course, happy to oblige. From the very start of our day together, Linda told me about her assignment to get my book autographed for her former colleague. Meanwhile we had so much of catching-up to do and an itinerary of shopping, eating and meeting another friend for dinner. By the time we sat down for dinner, Linda realized that she had left the book in the car. I volunteered to get it but she declared that we could do the book-signing when we finished our meal and returned to the car. So there we were in the dim carpark – with my book on the car bonnet – and I was much honoured to address my autograph to James Perix. Once again, I wish to express a BIG THANK YOU to all of you, proud owners of my book – all who bought my books for themselves and those who received it as gifts. This proud achievement of being nominated among the titles in the prestigious list of the MPH Best Non-Fiction books in 2017 was due to your support and encouragement. Thank you, all! My Johor Stories: True Tales, Real People, Rich Heritage has certainly made an impact on readers who are able to identify with the local content of my book and this just spurs me on to work on its sequel, with a more exciting and exclusive collection of My Johor Stories. I am truly honoured to have a prized item in hand, an autographed copy of My Johor Stories by Peggy, which is nominated among the MPH Best Non-Fiction Bestsellers in 2017. I just realised the extent both of you went to get my copy autographed: your constant reminder and persistence to have the book autographed, dim carpark and signing the book on the bonnet. Thanks to you and Peggy again for all your trouble. Wishing Peggy every success for her current book and her forthcoming sequel. Blessed Christmas and a Spiritual New Year to both of you." Thank you, James, and all of you who have also responded with well wishes. I'm truly blessed! When my sister, Pearly, suggested planning a Sisters’ Holiday during her visit from the UK, she also stipulated that it should be to a destination that does not need a visa. That’s because when we, the three sisters, made a previous trip to Hoi An, Pearly had to go to London to arrange for her visa into Vietnam. That experience was just too stressful for her so she requested that this time, we should go to where she does not need a visa. While considering various destinations in Asia, Pearly suddenly proposed a road trip to local destinations. Then she narrowed it down to visiting the highlands, just like how our dad used to take us to Fraser’s Hill, Ipoh and Cameron Highlands during the year-end holidays. Mum and dad would pack their three daughters in our trusted Volkswagen to head North from Johor Baru in the wee hours of the morning for a day-long drive. In those days, there was no North-South Highway so dad would drive the scenic route from dawn to dusk, making pit-stops at coffee-shops for us to use the restrooms, before we reached our destination. Memories of our family highland holidays – that later also included our younger brother – compelled us to seriously consider our destination options. Finally Ruby, our eldest sister, made the reservations online for late November to Fraser’s Hill and Awana at Genting Highlands because Cameron Highlands was just a bit too far a distance to cover for this road trip. The idea of staying in Awana was to explore the Premium Outlets there (shopping!) and to experience the recently upgraded cable-car ride to Resorts World at the summit. In fact, dad talked about going on the cable-car but at that time, the system was closed for refurbishing and he did not have the opportunity to enjoy the ride. So our sisters’ cable-car ride was somewhat on dad’s behalf. So with Ruby as our navigator, we made our way through Rawang before coming across another familiar town, Kuala Kubu Baru. Pearly, who was half-reclining on the back seat, was reading and dozing most of the way – and asking, “Are we there yet? She was also supplying us with snacks and sweeties (from the UK!) to keep us fortified for the drive. And when we reached the foothills and started to climb up Fraser’s Hill, she had her camera out to snap shots of the lovely scenery to keep as photo mementoes. Every now and then, she would let out a yell when she spotted an impressive sight and I would slow the car down and stop, if necessary, for us to take in the view and snap some shots. I remember the Rest House and its flower gardens at The Gap where we used to stopover for the wait because back then, there was a single route for up and down. Cars had to stop for the all-clear signal and took their turns to travel up or down that route. When we reached the turning to head uphill at The Gap, we spotted the Rest House and were sad to see how the once charming building, had fallen into a depressing, derelict condition. Perched on a hillock, the stone building still looked sturdy but the jungle had taken over and it was badly overgrown with weeds. As we leave the humid lowlands, the air was much cooler and I kept the car windows open to let ourselves be cooled by the natural air-conditioning! In the current monsoon season, the wind and rain had caused minor landslides along the winding route but there were ample signs to warn of the road conditions ahead. Maybe it was the feeling of anticipation coupled with the many stops we made along the way but it seemed like a long, long drive to reach our destination. The weather was comfortably cool and a mist hung heavily ahead when we read the sign, “Fraser’s Hill” at the top of the one-way ascending route that led to the town square, marked by its iconic clock tower. I drove in a crawl, taking in the familiar sights, enjoying the cool air and followed the signs that led to our hotel. Darkness descended upon us quite quickly and after such a long drive, we decided to keep the exploring for the next day. Instead, we explored the hotel and discovered a bookcase filled with lots of books – mostly in foreign languages – but we picked a few in English to enjoy during our stay. Dinner in the hotel restaurant was both comforting and satisfying, especially with the cold setting in that night. After dinner, I was more than ready to switch off for the night to rest and gear up for the next day. Snuggled under the cozy blanket and sheets, I dozed off quite quickly but was awakened by a consistent chirping noise that sounded rather close, in the dead of night. After breakfast in the hotel restaurant, we took a walk around the town square. Then armed with a route map of the network of roads at the summit, we hopped in the car to explore further afield. When we stopped to admire panoramic views of the nearby range of hills, we saw many hills enveloped in thick clouds while the air that swirled around us was cool and crisp. For a while it felt like we were really above these clouds! We saw that while most properties were privately owned by individuals, corporations or government agencies, Fraser’s Hill remained largely undeveloped. 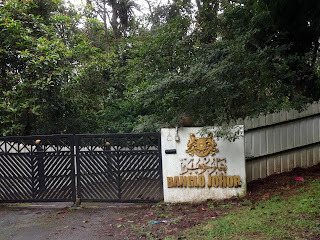 When I spotted the sign outside a property bearing the Johor crest, Jawi inscriptions and the words, BANGLO JOHOR, I screeched my car to a halt. It was a pleasant surprise but I just felt proud that Johor had a claim on this bit of Fraser’s Hill! As my sisters and I explored the sites, we realized that the walking trails and trek to the waterfalls were closed for the season so we went about admiring the lovely flowers and giant ferns that thrived better in the cooler and more conducive climate here. Polly [Right] and Sylvia [Centre]! While our time at Fraser’s Hill was a total chill-out Nature retreat, the opposite can be said about our time at Genting Highlands. Ruby, our able navigator guided us on a smooth drive from Fraser’s Hill to Awana at Genting Highlands and soon after we checked into the hotel, the monsoon rain came pouring down in a fierce storm. Unknown to us, our aunties Sylvia and Polly along with her husband, Uncle Steven, had planned a trip to Genting Highlands to coincide with ours – to surprise us! Once again, my sisters and I decided to dine in the hotel restaurant instead of going out in the heavy rain. We were glad to know that they arrived safely in the storm and were booked to stay at another hotel at Resorts World Genting. Then we arranged to meet the next morning at the Arrival area where we would exit from the cable-car ride. A short drive from the hotel took us to the Genting Highlands Premium Outlets – laid out quite similar to our Johor Premium Outlets – but before exploring the shops, we found our way to the cable-car station (within the building) to head uphill. When we alighted, our aunties were eagerly waiting to welcome us and show us the sights they thought should interest us. The entire Genting Highlands network of buildings in Resorts World was new to me and it was good to have our aunties (who are familiar with it!) to be our guides. Besides eating a wide range of local street food at the Malaysian Food Street food court, we also spent time in the Visitors Galleria to see a gallery of photos, mementoes and video of the work and legacy of the Resorts World’s founder and developer, Tan Sri Dr Lim Goh Tong. From the fogged up glass panels, we knew that it was raining heavily outside but our aunties wanted us to step outside for an experience of the natural coolness here. So we made our way to the porch and stepped out, just to get whipped by the wind! Then we went browsing in the shops and finally, took a walk through the casinos – from the smoking section to the non-smoking section – just for a view of what went on in there. After spending the day in Resorts World Genting with our aunties and uncle, my sisters and I took the cable-car back to the Premium Outlets to explore the shops. Looking back, it was amusing that the second half of our sisters’ Highland Holiday also included our aunties and uncle, and it was altogether, a very special time together. After breakfast the next morning, we loaded our luggage in the car along with extra bags – filled with shopping – and headed downhill, for a drive back to JB via Kuala Lumpur. It’s late November. Whipped by a cool breeze under a cloudy sky on Fraser’s Hill, my sisters and I are exploring a flower garden. My sisters, Ruby, Pearly and I, are on a road trip. Pearly, visiting from the UK, wanted to see our highlands again so we planned a sisters’ highland holiday – reminiscent of how our dad used to take us on year-end trips to Cameron Highlands when we were kids. In a morning drive to explore the sights on this hill resort, I keep the car windows open to let the natural air-conditioning cool us in the car. Every now and then when we spot an interesting flower or an exciting view, I stop the car for a brief walkabout to enjoy the natural beauty of Fraser’s Hill. We spotted the brightly coloured flowers from afar and decide to have a closer look. In this garden designed around the stone cottage, my sisters’ attention was riveted to a (wild-looking) species of Anthuriums with its spadix or spike clustered with tiny flowers. I don’t like its creepy look so I wander off to look at other flowers. Then I see rows of Lilies flashing its prominent petals in two-tone Red and White colours, growing in profusion in this mild and conducive weather. It had rained during the night (I remember the sound of the howling winds!) so the Lilies looks a bit battered this morning. The sight of these Red Lilies gives me an instant flashback to thoughts of dad. At home, we have a flower bed planted with Lily bulbs – the same Red & White type – which dad used to carefully weed and tend to regularly. This flower bed was dad’s own precious plot but even though he added new earth and fertilizers, these temperamental Lily plants rarely bloomed. As dad advanced in age and could hardly do any gardening, mum took over minding this flower bed. But on rare days when dad felt exceptionally good, he would sit on a stool to weed his Lily flower bed. I clearly remember an incident which took place while I was not at home and I was simply horrified when mum shared the dramatic account of what happened with me. That evening, dad was feeling well enough to do some gardening so he grabbed a nearby plastic stool (which had been in the garage for some time), to sit on to do his weeding. Plastic stools are mostly made of recycled plastic and this particular stool, which was left outdoors for some reason, was not only old but brittle. Mum described how she suddenly heard a loud crack and turned to look at the source of that sound. Our neighbour, also in her garden and had witnessed this scene, started shouting in alarm and asked mum to open the gate for her to come over to help dad. Meanwhile, mum made a quick assessment of the situation and was relieved that dad was not hurt but just winded by the sudden hard landing on his bottom! Once mum was assured that dad was unhurt, she told him to catch his breath while she looked for a way to help him up. She thought of a portable wooden bench in the porch and brought it next to dad to help him prop himself up. Then she helped him to regain his footing before he managed to heave himself up to sit on the bench. Whew! Ever since this unfortunate incident, dad was banned from sitting on plastic stools ever again. So each time dad wanted to do some weeding on his precious plot of Lilies, he would then sit on a wooden stool. Due to physical weakness in his advanced age, these times became so infrequent that I had to capture the moments with a photo each time he was able to weed his plot of Lilies. Since dad left us in January 2016, mum had been tending to the garden and often talked about dad’s Lilies – that plot of plants that rarely bloomed. Every now and then, mum talked about turning over the earth – getting rid of the old Lily plants – and replanting with new plants because those Lilies hardly ever bloomed. But it looked like mum’s idea was a half-hearted one because to this day, dad’s Lily plants are still thriving in the same flower bed. The sight of these Lily blooms in Fraser’s Hill brings back a flood of memories and foremost is how several stalks of dad’s Lilies bloomed a deep dark Red colour on July 15. I cannot forget that date for my book launch, a morning event which was not only joyful but deeply emotional for me. After the event, mum and I had decided to drop our things at home and head out again to visit Puan Ramlah Mohamad, who initially agreed to come but due to a personal matter, could not attend the event after all. I wanted to see Pn Ramlah or Auntie Rom, as she’s fondly called, to present her with a copy of my book, My Johor Stories: True Tales, Real People, Rich Heritage, as she was one of the personalities featured in the Portraits section. It was a bright and sunny afternoon and as soon as I parked my car, I rushed into the house but mum lingered in the garden. Even though I was in a rush to go to Pn Ramlah’s, mum’s revelation made me pause to consider how uncanny and significant it was for dad’s rare-blooming Lilies to bloom on that very day! The sight of the Red Lily blooms in dad’s precious plot, simply capped the day where his presence was deeply missed. So I stand here, whipped by a cool breeze under a cloudy sky on Fraser’s Hill, admiring the lovely Lilies bending in the breeze. And I’m missing you, daddy. It all started in Johor Baru – more specifically – at the Convent of the Holy Infant Jesus, the only Convent school in Johor Baru. The JB Convent was then fondly known as CHIJ. Some of us met in Standard One and continued as class-mates right up to Form Five while some joined the school when their parents came to JB on job transfers. It made no difference to us. The friendships that were formed in school continued even after we left for further studies and while we moved away from JB for our careers or families. Since we reconnected again for our class reunions – all held in JB - the use of social media and the convenience of WhatsApp kept us connected wherever were are in the world. Whenever a former classmate came back for a visit, it was an opportunity to meet up for a meal and to catch up on the latest happenings in our lives. It’s all quite casual and impromptu. Just about anyone who was ready to meet up could just initiate a gathering and whoever were available on those dates, would just join in. “No, I’m alone. Husband and daughter could not come,” read Angeline’s reply. This reply somewhat cleared the way for an active discussion on when and where to meet again! We understand that Angeline’s time with her family here comes first, so it was only polite to ask her to share her most ideal dates so that our plans to meet up could be made at her convenience. Angeline, who had plans to visit her family members residing in Singapore, Kuala Lumpur and JB, shared her dates with us and it did not take long for our meeting plans to materialize. While the discussion for the meet-up in KL was underway, suddenly photos of a group who met with Angeline in Singapore for breakfast, were posted in the group chat! Wah! The Singapore group clearly wasted no time to arrange a gathering there. To help me decide on where to hold the gathering in JB, I asked Angeline about her food preferences and if she had any particular food item that she would like to taste again. “How about satay?” she replied. And this set me thinking about the possible places to enjoy a good satay treat. I’m sure she does not have the opportunity to savour good satay in France so I gave much thought to considering the best satay options here. It’s also December so I prayed for fine weather so that our outing for satay will not be dampened by monsoon rains. And my prayers were answered. It was a breezy and balmy evening, pleasant weather to be dining outdoors and we enjoyed a lovely time together over skewers of satay. Our conversation flowed easily, as if we just met in school yesterday. But when a live band struck up the chords to perform, we decided to leave as it was difficult to chat with live entertainment happening near us. Kuala Lumpur, plus two who flew in from JB! Angeline told us about how she was enjoying local fruits and fresh fruits that are not found in France – its natural sweetness and how juicy it was – and how she longed for more. So after our savoury meal, it was time to cool our palates with some cool sweetness – fruit flavoured shaved ice topped with real fruit. She was so impressed with the varieties of shaved ice concoctions on the menu that she brought her sisters and brother-in-law back there after lunch, the very next day! Two days later, Angeline was in KL and there she met with the KL group at a restaurant inside a mall in Petaling Jaya. Angeline was deeply touched that two girls from JB took a day-trip flight to KL just to join the gathering and as an opportunity to meet up with the others in KL too. “Thank you to all our super CHIJ classmates who came together for an afternoon of nostalgia and simply a good time catching up!” said Angeline.